Has traditional media become old hat in Albanian politics? A boom in live internet streaming in the run-up to June's presidential elections suggests this might be the case. Balkan Investigative Reporting Network (BIRN) reports that both Socialist Prime Minister Edi Rama and the opposition Democratic Party leader Lulzim Basha have dispensed with spending time on media interviews in favour of web fame. 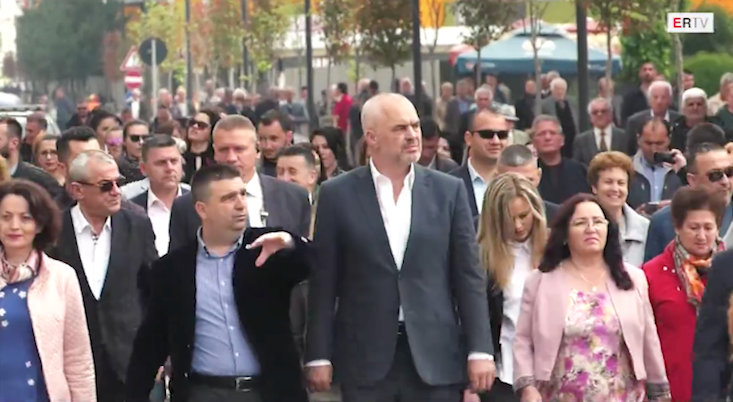 Mr Rama has even go as far as to launch his own web channel: ERTV, a one stop shop for official meetings, television appearances and all things Edi Rama. “This is a communication tool without mediators. Your meditation [referring to journalists] [...] often serves third parties,” Mr Rama said on 7 April, highlighting live streaming as a more direct form of communication. Far from facilitating bias-free coverage, the trend appears to be preventing more traditional media from presenting balanced reports, with the live streams themselves feeding and providing basic content for many media outlets. “I find it very disturbing that the overwhelming majority of content in the media is the same as that distributed by the politicians on Facebook,” Lutfi Dervishi, a journalism lecturer at Tirana University, told BIRN, highlighting that this direct communication between politicians and the public circumvents the traditional role of the media as a force for questioning, interpreting and providing balance. Neritan Sejamini, a political science lecturer also from Tirana University, suggests that the trend represents a case of smoke and mirrors — does this unfiltered communication simply create the illusion of transparency?